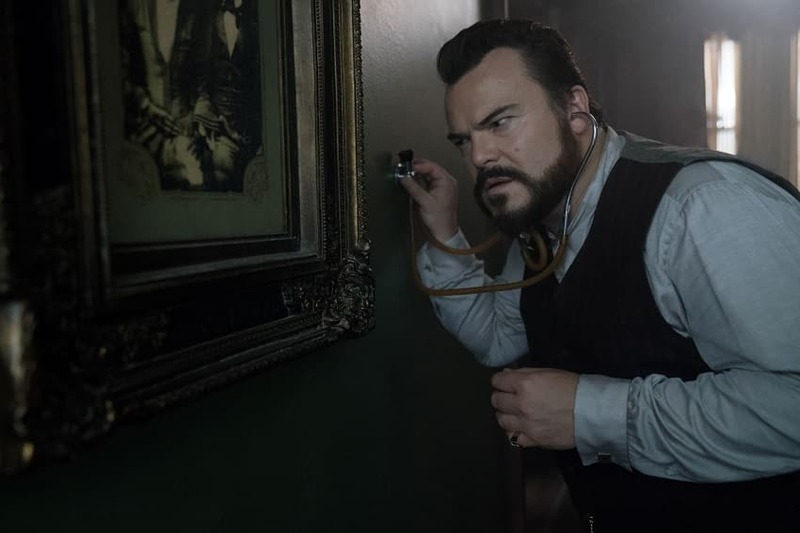 The House with a Clock in its Walls movie from Universal Pictures is here and we have the scoop on what parents need to know before heading to the theater. Is The House with a Clock in its Walls too scary for kids? What is the best age to watch? What is the rating? We’re going to give you all the info you need with only minor spoilers so you can have a great family movie night. It’s time for another parents’ guide to the movies. Jack Black and Cate Blanchett star in The House with a Clock in its Walls movie in 2018, bringing a decades old book to the big screen. We had a chance to screen the movie thanks to Universal Pictures and I have some thoughts on this spooky addition to the fall lineup. Thanks to Universal Pictures for providing tickets to this screening. Post contains affiliate links which means I may earn money on purchases made. 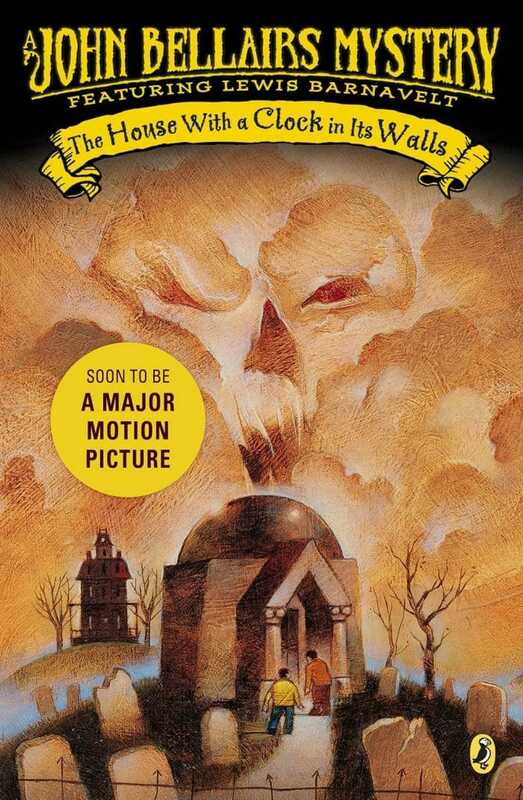 The House with a Clock on its Walls movie is based on the novel by John Bellairs and directed by Eli Roth. Synopsis: The magical adventure tells the spine-tingling tale of 10-year-old Lewis (Owen Vaccaro) who goes to live with his uncle in a creaky old house with a mysterious tick-tocking heart. But his new town’s sleepy façade jolts to life with a secret world of warlocks and witches when Lewis accidentally awakens the dead. Beyond this adventure, the movie is also about finding family and hope after loss. Set sometime around the 1950’s, you’ll find lots of themes and throwbacks to this era. I especially loved the colors in the film, which all had a dark and sometimes orange tint. It was a nice mix between creepy and old fashioned. Jack Black is such a fun creepy uncle and I loved seeing Cate Blanchett’s silly side. That said, I really wanted something more from them both. I could sense much more story there and wished more time had been spent on it. The young star, Owen Vaccaro really held his own throughout the movie. He did a great job with a range of emotions and I’m sure we’ll see more of him. Kyle MacLachlan always brings a good villain and his crazy eyes definitely came out to play. As the evil magician who gets his moment toward the end of the film, his character isn’t as prominent leaving some fans wishing for more from him. Of course “the house with a clock” also felt like one of the characters without being too distracting, even though completely CGI. I am pretty good at disappearing into a movie and I had no issue believing the chair had feelings and the topiary griffin was just a big kitty. Want to know a little more before you go? Watch is the official trailer for The House With a Clock in its Walls. Now here’s where the wheels come off a little for me. 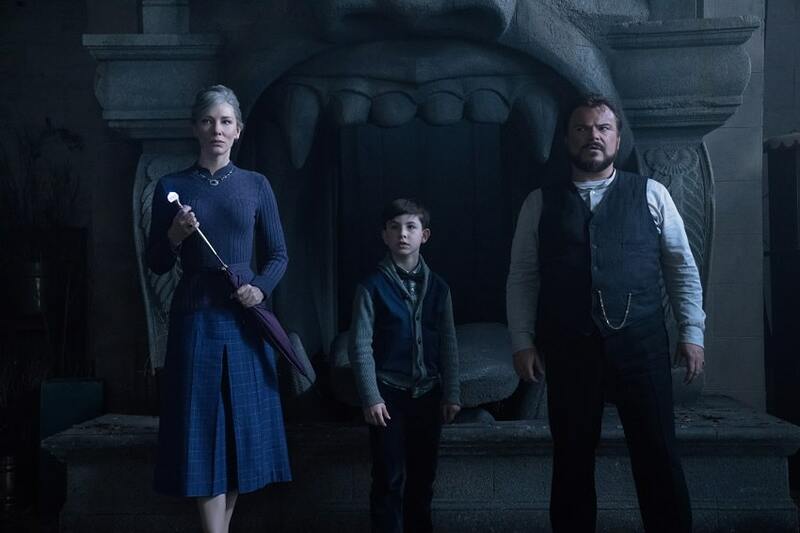 The film is based on The House with a Clock in its Walls book written by John Bellairs and illustrated by Edward Gorey. I never read this book growing up and from what I can tell reading online, it was pretty terrifying. That was never my style as a kid so I’m sure that’s why I never took interest. Some critics of the movie (based on the trailers) say that its not scary enough and doesn’t do the real story justice. It’s the old “the book was better” line so if you’re a die-hard fan, you may see some differences. I can’t say one way or another but wanted to point that out. Is The House with a Clock in its Walls Movie too Scary for Kids? So is the The House with a Clock in its Walls too scary for kids? As you might expect, I have to say it depends on the kid. This movie is officially in the “kids horror” genre and despite the PG rating there are definitely more than a few creepy moments. I’ll share my thoughts on what might bother you with a few mild spoilers so this is your warning if you want to go in cold. I’m guessing you don’t since you’re here, but there you go. Why is The House with a Clock in its Walls rated PG? Well, there were at least 3 swear words (two damns and a hell) and possibly more but that’s all I counted. There is a recurring poop joke that is silly more than crude but definitely a cringe moment or two. Violence isn’t really an issue in this movie but there are some recurring disturbing images in the form of an un-dead character and another who contorts quite unnaturally during a transformation. There is also a demon during a fast-paced montage/memory and he is pretty gross. As you saw in the trailer, the house itself comes to life in the form of dolls, moving furniture and the like. I also want to note that there are several mentions of death in the movie. The plot is based on the fact that a boy moves in with his uncle after his parents’ death and this is explored a little bit. If you or your children are sensitive to that type of storyline, it may be an issue. I’ll be honest in that I was creeped out more than my kids (boys, age 7 and 9) were. Horror (kids or not) just isn’t my thing. They both enjoyed the movie and didn’t have any issues with being scared or sleeping afterward. That said, your mileage may vary. The evil in the movie is straight up creepy and yes, there is blood magic which always makes me uncomfortable. To the film’s credit, this is seen as the bad kind of magic but still unnerving to me. If you have children who don’t like seeing the evil villain for an extended period of time, this is probably not the movie for them. There was a bit of humor to break up the tension and the set design, music and sound effects were really interesting to me. But I don’t know that I would see the movie for that alone. Of course, as parents we tend to pick movies apart. But if you asked my boys, all they remember is a fun night out as a family. The bottom line, The House with a Clock in its Walls is here for the Halloween season for a reason. It’s a humorous adventure that has heart but definitely a dark side. There are plenty of light moments but the dark moments are really dark. I’d say tween and up should be ok in terms of not being scared but for anyone under 10, proceed with caution. 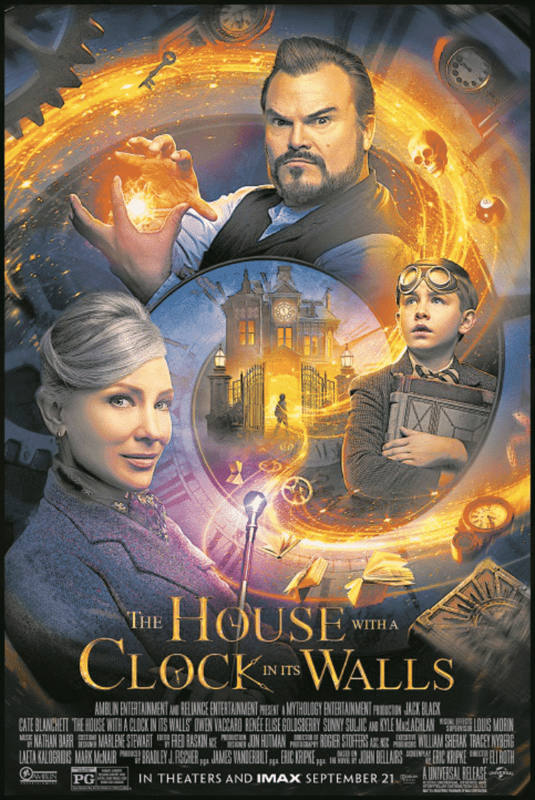 The House with a Clock in its Walls opens on September 21, 2018. It has a run time of 104 minutes and is rated PG. Enjoyed reading this blog, very helpful! I’m so glad to hear this. Thanks so much for stopping by!